Also known as the Phelps House, Rose Hill was built as part of Aiken‘s former Winter Colony, a luxe and expansive district where wealthy Northern families once stayed from late autumn through early spring. Aiken’s mild climate was said to promote health and help prevent diseases such as tuberculosis, and its loamy soil made it an ideal place to raise horses. Together these characteristics attracted aristocratic clans like the Astors, Vanderbilts, and Whitneys. The equestrian legacy of these eighteenth-century scions continues to this day, and Aiken is now known as the “Thoroughbred Capital of the South,” home to the Thoroughbred Hall of Fame. Colonel Sheffield Phelps and his wife Claudia built their spacious 34-room home around 1898 on the foundations of an antebellum house which burned during the Civil War. The Shingle-Style Dutch Colonial manse is reminiscent of homes seen along the shores of New England, making it an unusual design for the South. In fact, the Phelps family summered in Bar Harbor, Maine, where the style was popular. Though the home stood out among the Greek Revival mansions that more typically graced Aiken’s Winter Colony, its formal gardens, designed by Mrs. Phelps herself, made it one of the most elegant estates in South Carolina. The house and gardens encompassed an entire block – 4.2 acres – and included stables, three greenhouses, a children’s playhouse, and many rare and imported plants. The “Rosehill Red” camellia, which Mrs. Phelps developed here, gave the estate its name. Though her husband died in Aiken in 1902 of typhoid fever, Mrs. Phelps continued wintering here and held the first meeting of the Garden Club of South Carolina at Rose Hill in 1930. She owned the estate until her death in 1955. Later, the estate was used by a religious school and also by the art department of the University of South Carolina at Aiken. 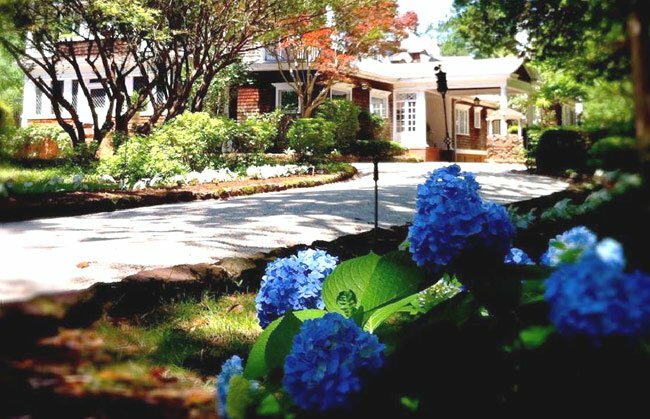 In 2002 it was purchased by a mother-and-son team who have turned the property into a popular inn and event venue, retaining the integrity of the estate envisioned and executed by Mrs. Phelps. 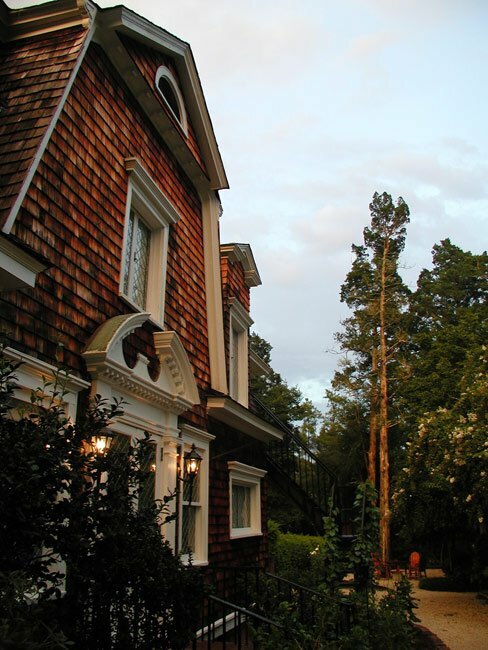 (Rose Hill) The Phelps House is a noteworthy example of the Shingle Style, frequently used in late nineteenth and early twentieth century resort homes for the wealthy, but relatively rare in South Carolina. The Phelps estate, which served as the location for the first meetings of the Garden Club of South Carolina, contains a formal landscaped garden. The elegant home and landscaped grounds are characteristic of many such estates owned by the wealthy in pre-income tax America. The Phelps House was built in the early 1900s on the foundations of an antebellum house destroyed during the Civil War. Designed as a winter home, the two-story house has an exterior surface of wooden shingles broken by windows, gables and doorways trimmed in white. The house contains over twenty rooms. Entrance to the house is through a porte-cochere supported by Doric columns. Original owner of the house, Mrs. Sheffield Phelps, landscaped the grounds and formal gardens containing camellias, azaleas, hollies, and English boxwood. The Phelps family spent from November to May in Aiken and usually spent summers in Bar Harbor, Maine or Europe. 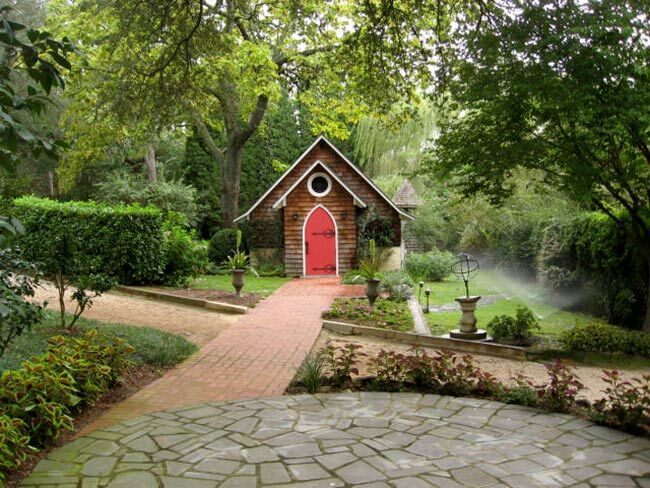 Outbuildings include original stables, garage, kennels, three greenhouses, toolhouses, and a children’s playhouse. Grew up with grandparents’ house across the park on Edgefield Avenue. My mother (deceased) was Alma Walker Perry. Was inspired to present Flower Gardning Skills acquired from the Phelps Garden Parties as a Home Economist for 40 years in Ga & SC.